Spoiler alert: I did not win. Did not even place. But, wow, what an experience. And the things I’ve learned about homemade ice cream along the way… Well, that’s why I’m writing this post. As the days here in Central Texas have crept ever-upward into double digits, I’ve contentedly puttered around in the kitchen, conjuring up delicious (and sometimes even healthful) desserts on my homemade ice cream machine. Along the way, I’ve developed a bit of confidence, maybe even swagger. So when I learned that the (first ever, but extremely promising) Independence Day Spectacular festival put on by our local newspaper would be holding a homemade ice cream contest, I was intrigued. For all my tinkering, I’ve actually never developed an original recipe before. I’d never made batch after batch of variations for side-by-side testing, tweaking ingredients or amounts until I’ve gotten it just right. I didn’t actually get the opportunity to do it this time, either, but I came close and I was pretty happy with what I came up with. At last, I decided to adopt a theme for my recipe that didn’t exactly call Independence Day to mind, but one that paid tribute to the season — one that used locally-available seasonally-appropriate ingredients. I hoped that playing to tradition in this way — bringing to mind days gone by when you couldn’t GET these ingredients at any time but summer — would overcome the novelty and “weirdness” of my recipe choice: Summer Sweet Corn and Buttermilk Blackberry Ice Cream. I’ll share the recipe below, but first a few words about my decision-making. I tried various ways of infusing the corn flavor into the ice cream. The recipe that inspired my variation used a corn cob, along with the kernels, which cooked with the milky liquids to infuse it with flavor. I didn’t have cob corn, so I tried just corn kernels, but I blended them up with an immersion blender to amp up the flavor. The problem? The result was lumpy-ish with corn solids, which I mistakenly believed was due to my substitution of cottage cheese for cream cheese. Later, I tried just using corn kernels without blending them, but the result just wasn’t “corny” enough. I started with a version in the style of Jeni’s Splendid Ice Cream of Ohio, which uses cornstarch as a thickener rather than egg yolks and employs cream cheese for smoothness. Then I wanted to try egg yolks, but the result — though delicious — was a bit too heavy tasting for summer. I ended up splitting the difference and using egg yolks, cornstarch AND cream cheese. I wanted the depth of flavor without the heaviness. Not knowing that the corn solids had caused the lumpiness in my initial batch, I immersion-blended the corn kernels into the milk mixture on my contest-entry giant gallon batch. But then, when it came time to strain the corn pieces out of the mixture, it was pretty much impossible to get all the milk a strainer while keeping the corny bits behind. So I went full throttle and put my fancy blender into service, blending everything super super fine and incorporating the corn into the batter completely. The result was plenty smooth and very very corny — which went deliciously with the blackberries, though there were far too few of the blackberries in the end. In concocting my final effort, I referred to lots of different sources, but especially Ice Cream Science, which offers a handy dandy spreadsheet for calculating various ice cream blends. Because science! The site taught me a few key things, the most important of which is: the enemy of homemade ice cream is iciness. To avoid iciness, freeze your ice cream as quickly as possible as cold as possible, and keep it consistently cold. To this end, put everything you’re using in the churning process (spoons, churning paddles, storage containers, etc.) into the freezer so that it doesn’t hinder the freezing process. Additionally, keep air away — by using Ziploc bags in an ice bath, and, after churning, seal off the top of the ice cream from the elements with parchment paper or plastic wrap. In a bowl, stir together 2/3 cup milk and the cornstarch; set slurry aside. In a 4-qt. saucepan , combine the remaining milk and the cream, sugar, honey, buttermilk powder and salt. Add corn kernels. Using an immersion blender, blend together all of the ingredients until the corn kernels are all broken apart and the rest of the ingredients are well mixed. Bring to a boil over medium-high heat and cook for 4 minutes. Stir often to ensure nothing is sticking to the bottom of the pan. Reduce the heat to medium-low. Put the egg yolks in a medium-sized bowl and whisk them or mix them with an immersion blender. Take a small amount of the warm mixture and add it to the bowl with the egg yolks. Whisk the yolks and the mixture until well-blended, then add it all back into the saucepan. Add the slurry of milk and cornstarch. Raise heat again to medium-high and return to a boil and cook, stirring, until thickened. Remove it from the heat. Pour mixture into a high-powered blender (Blendtec or Vitamix type), and blend thoroughly on high power until all corn pieces have been blended into a fine puree. Do this in batches if needed, depending on the size of the blender. Place cream cheese in a bowl and pour in 1 cup of the blended hot milk mixture; whisk until smooth. Pour in the rest of the mixture as it is blended and whisk to mix well and incorporate the cream cheese. Pour mixture into a Ziploc bag, sealing in as little air as possible, and submerge in a bowl of ice water until chilled. Place plastic bag in the refrigerator for several hours or, ideally, overnight. Pour mixture into an ice cream maker by cutting off one bottom corner of the bag and squeezing the mixture out. Process according to the instructions provided by the manufacturer of the ice cream maker. 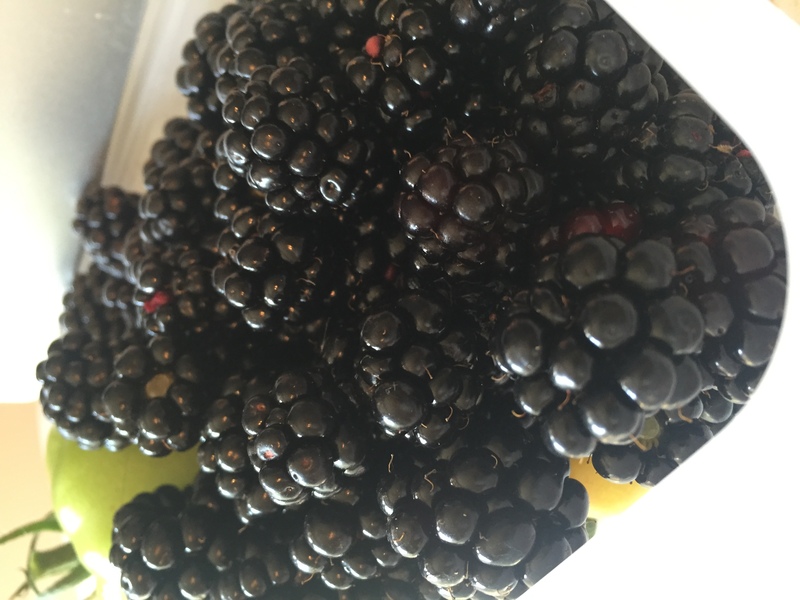 Combine blackberries and sugar in a 1-qt. saucepan over medium-high heat, and cook, stirring, until thick, about 8 minutes; strain and chill. 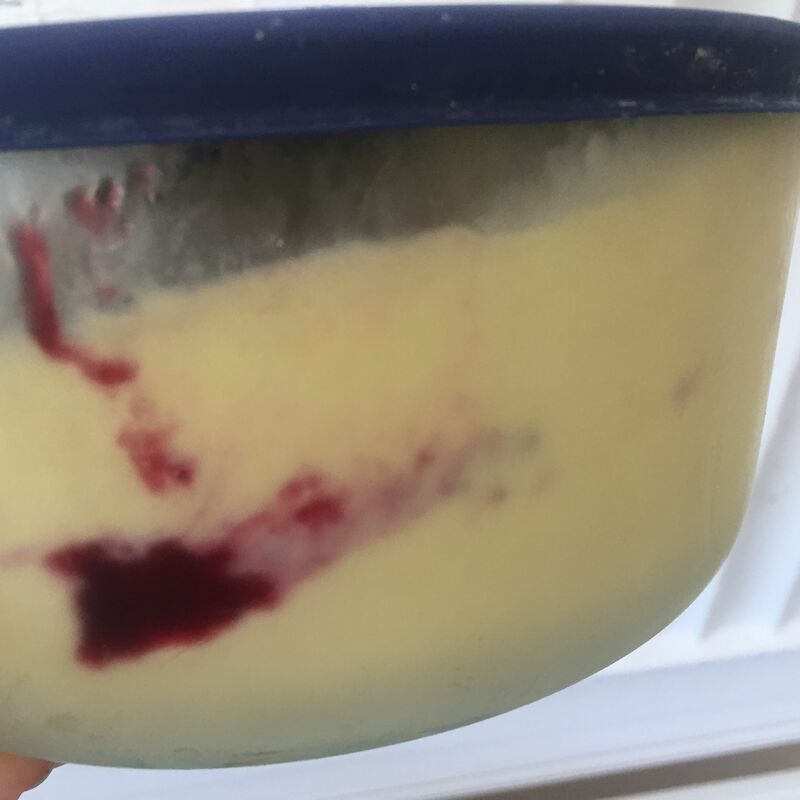 After churning, alternate layers of ice cream and berry sauce in a storage container before freezing.